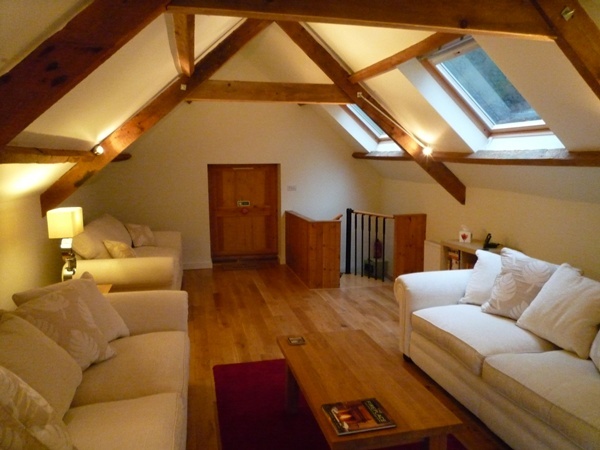 The Gate House is a sympathetically converted detached barn situated on the outskirts of Bath. 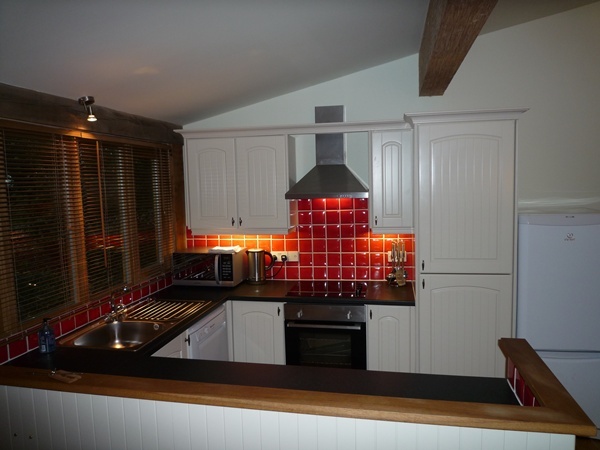 Designed as self-catering accommodation, it is spacious and modern whilst retaining many of the original features. Accredited with a 4 star rating, Visit England has also awarded for The Gate House with its gold award for the seventh year running. 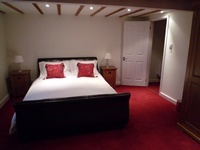 This award is presented for exceptional quality of accommodation and customer service. It's a large property with two double bedrooms sleeping up to four guests. 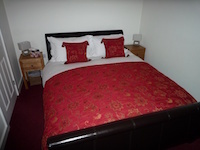 Two double sofabeds are also provided. 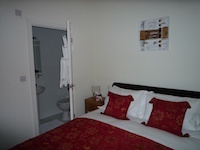 There's wifi and all towels and linen are provided. Ample parking is available adjacent to the accommodation. 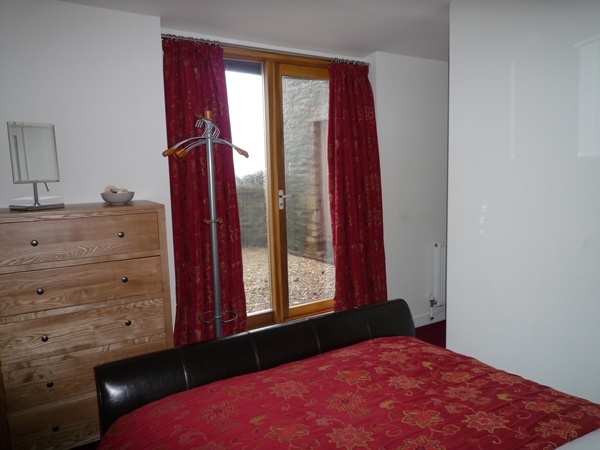 The property has two double bedroom with double sofabeds situated in the sitting room and dining room areas. Guests should be aware that we are situated on the main A46 road into Bath - the Gate House having been built long before the road. This means that there is some background road noise in the property. For those of you wishing to spend a few days shopping in Bath, the Gate House is just ten minutes drive from Junction 18 of the M4 motorway and only a further ten minutes to Bath City Centre. It's ideal position enables you to enjoy Bath's countryside and the architecture and spending opportunities in Bath City Centre. Those of you who may have shopped in Bath will realise that parking is often difficult and expensive! and, with this in mind, we have a parking space available to guests, in Bath City Centre, for the duration of their stay. Further shopping opportunities can be found at Cabot Circus and Cribbs Causeway both reached in about half an hour (depending on traffic), and Cardiff which can be reached within an hour. These shopping areas can also be easily reached by train. Other local attractions include Longleat, Lacock, Stonehenge, Salisbury, Wells and the Cotswolds. 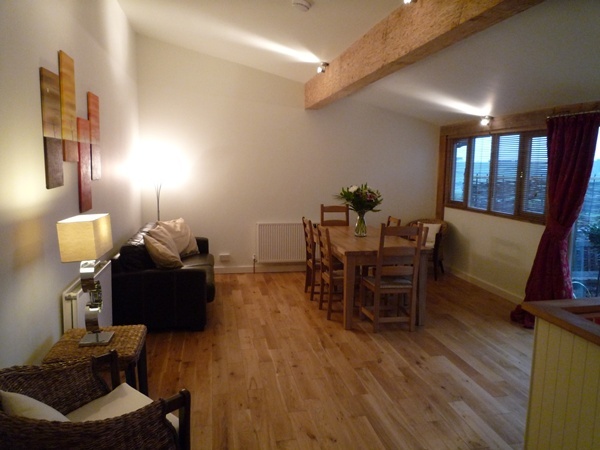 The front area of the ground floor is the large Kitchen/Diner with lofty ceilings and oak floor throughout. 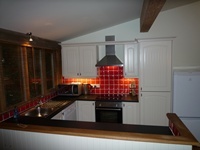 The Kitchen is fully fitted with electric cooker, dishwasher and washer/dryer. Iron and Ironing Board are also provided. 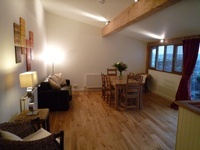 The Dining Area has comfortable seating and a double sofabed in addition to dining for six people. 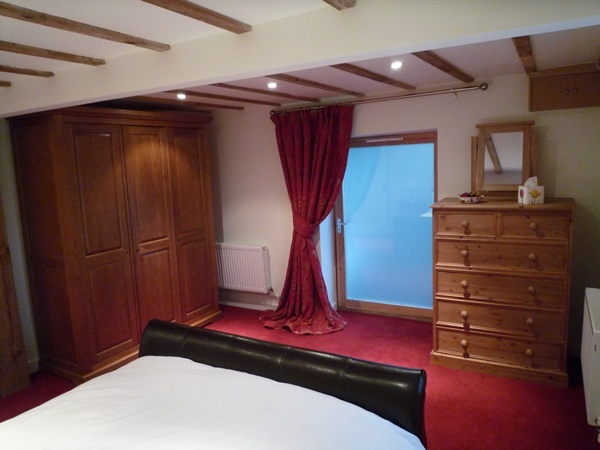 To the rear of the ground floor, a luxuriously carpeted hallway leads to the Bathroom with shower and bath and two Double Bedrooms, both with king size leather sleigh beds and one with en-suite. A hairdryer can be found in the chest of drawers in each of the bedrooms. A spiral staircase leads up to the Sitting Room. 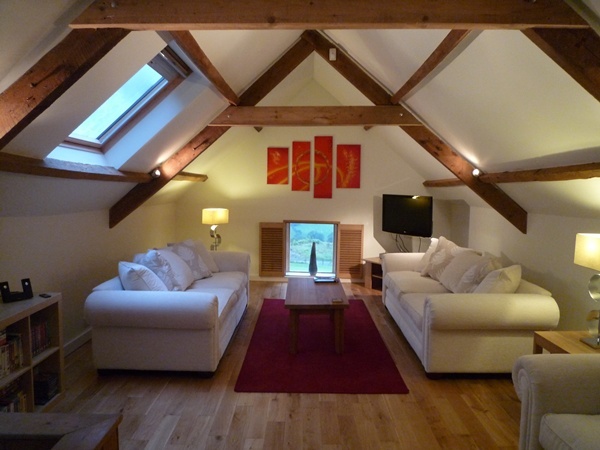 This large and spacious room enjoys magnificent views over Langridge valley and is an ideal space to chill-out after a day's shopping in Bath. 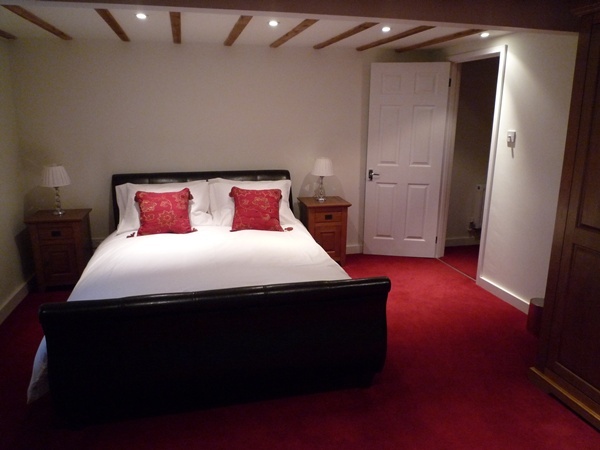 The oak floor and large comfy sofas are designed for relaxation and, for those who want to watch TV or play games there is a 37" flat screen TV, playstation 2, a video/DVD player and IPOD docking station with speakers. There are also a large range of videos and games available to choose from. Please contact us for our rates for the period covering Bath Christmas market along with the Christmas and New Year bank holidays. Turn off the M4 at Junction 18 and head south along the A46 towards Bath. Pass through Pennsylvania, over the roundabout where the A46 crosses the A420 and continue south through Nimlet. Shire End Farm is on the left hand side of the road just the other side of Nimlet. As you approach the farm, you will pass the Bath & North East Somerset county sign, a sign on the left to St. Catherines and a sign on the right to Tadwick. Look out for the Bends sign. Head east out of Bath on the A4 and when you hit the Batheaston roundabout at the edge of Bath follow the signs for the Motorway, which will take you north on the A46. At the top of the hill at the end of the dual carriageway (Tree Tops on the right hand side) you will encounter a series of bad bends and a narrow layby on your right. As you come out of these bends, and start to descend slightly, you will see the entrance to the Farm on your right which is at the end of a small track (leading to the old airfield) opposite a builders yard and Four Winds Farm.